It’s January and the winter, here at the northern hemisphere, is still far from gone. Although I am quite busy in the garden to create some new parts, I would like to take you to another stunning estate at the South African Cape region. Vergelegen has quite a history and was originally owned by Willem Adriaan van der Stel, which was granted to him in 1700. 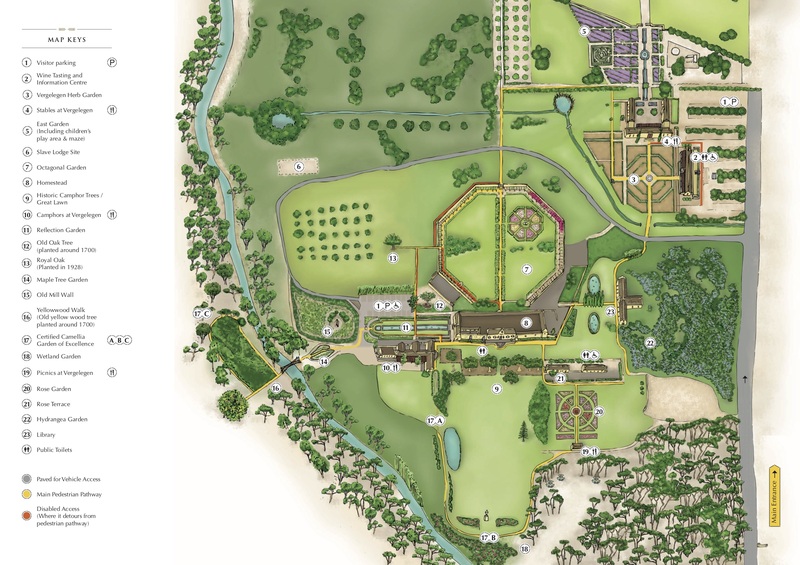 He was very interested in horticulture and agriculture and loved experimenting on the estate. One of the earliest South African gardening Almanacs was also written by him. As Governor of the Cape he was, however, more known for his greed and rather corrupt and dictatorial behaviour. People revolted against him and in the end he was dismissed and sent back to the Netherlands. The estate was partly dismantled and divided. But of course for me the main draw was the gardens and with 17 gardens on the estate you will not be disappointed. Another amazing feature are the large amount of old trees. The oldest oak tree (Quercus Robur) of South Africa can be found here. From around the same period you can find a whole row of 5 ancient Camphor trees and an impressive Yellowwood tree. All these trees were planted between 1700 and 1706. Less old, but really beautiful is the Royal Oak, planted in 1928 from an acorn originating from the last of King Alfred’s oak trees at Blenheim Palace in Oxfordshire. Near the entrance you stumble straight onto a nice octagonal herb and vegetable garden that provides the restaurants here with fresh produce. Before we headed to the old heart of the estate we took a little detour to the back of the Stables restaurant. Here a long pond and water feature is surrounded with fields of agapanthus. Next to it is the maze : a great opportunity to do some hide and seek… my inner child enjoyed it a lot :-). Next is the beautiful octagonal walled garden at the back of the residential homestead. Some wonderful borders guide you all the way to the house, while the walls are covered with bright Bougainvillea and other climbing plants. Don’t miss the charming little water feature at the side. When you leave the garden through a gate in the wall at your right side you stand eye to eye with the majestic Royal Oak. Next up is the oldest oak of SA next to the calm reflection garden. Through a still young Maple tree garden you cross a bridge to a shaded forest full of Camelias. It was a pity we were there outside the blooming season as they have an extensive collection that even got the title of Camelia Garden of Excellence, one of only 17 such gardens in the world. Don’t miss out on the old yellowwood tree here as well. One of my favourite parts of the garden doesn’t boast a lot of flowers, but is so lush and green that it makes you dazzle : the wetland garden. Wooden paths are surrounded by a wonderful collection of ferns and wetland plants. It is quite stunning to see this kind of lushness in a dry area of the world. Passing another part of the camelia garden and a beautiful old camphor forest we arrive at the large rose garden. Although I love roses, I have never been a real fan of the typical rose garden. I’d rather love to see them incorporated in mixed borders than just in large quantities. 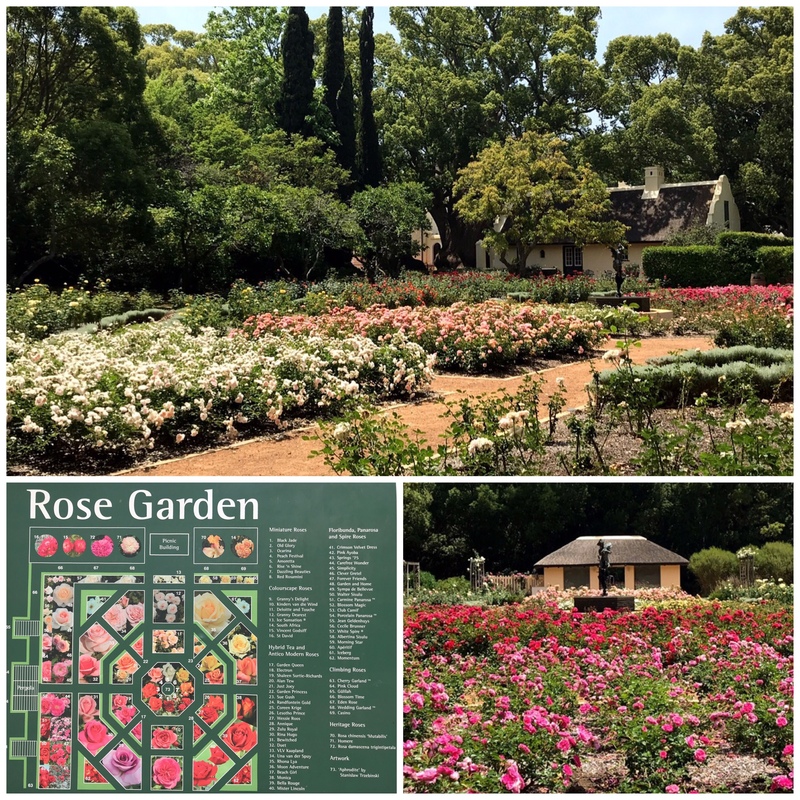 But this is nevertheless quite an impressive rose garden with over 80 varieties and a total of 1500 plants. In November they are in full bloom and it does have quite an impact. In front of the homestead the 5 old camphor trees stand as some muscular guards. It’s hard to describe, but they are huge ! At your left is the beautiful library building surrounded by hydrangea. Vergelegen was a real treat, and with some fine dining and/or wine tasting on top of the beautiful gardens, this can keep you busy for a half or even a full day.